The crew and I have continued our adventures through the Skull Island Skyway. After acquiring our new ship, the Grand Garnet, we sailed to Flotsam to attain some information for the Frog Father about the Rat Pack. Seems this pack of rats are trying to move in on his territory and he’s asked for our help to find out who’s behind these deeds. While we’re looking for more information about the RatPack, we’re also picking up clues concerning Ratbeard and Captain Gunn’s treasure for Avery back in Skull Island proper. All these extra favors for the town folk in Skull Island and Jonah Town brought in some a great source of loot and gold. We were able to outfit the Grand Garnet with the top gear and even paint her a nice burgundy color to match her name. We even picked up a new armor for the bow during a battle in Flotsam Skyway against the Ghost Ships. She has proven to be a great ship and the crew and I really have been enjoying our sail through the skyways at her helm. We took her up against Cutthroats, Rapa, Monquistans and unDead Pirates and she’s still in great shape and triumphant. Not once have we lost a battle aboard our fine vessel. The most important journey has been to the Flotsam Skyway and the isle of Flotsam. We met a fellow named One-Eyed Jack who gave us some good clues about where to find RatBeard and indeed we did find him. But once again he gave us the slip. We ran off to the Ruined Lighthouse to gather some additional clues about Captain Gunn’s first mate. We found his grave sure enough, but to get to the clue we had to defeat an undead WitchDoctor. The Crew and I were a little worried about this confrontation but thankfully we were able to take him on and gather the information we needed. Amazingly enough, he asked to be part of our crew as well. 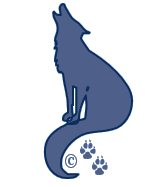 I’m not sure about this Old Scratch character, but I something tells me he’s going to come in handy. So my crew really is getting bigger, glad we have a large ship to fit everyone onto. And it was soon evident we were right. The clues lead us to an island in the Flotsam Skyway called Bounty Island, said to be the location of Gunn’s tomb and treasure. Gunn left behind several clues for a good Captain to figure out and implement. If you know about rigging, firing your canons and navigation, you’ll easily be able to discover the underground tomb. Sadly it appears RatBeard had once again been one step ahead of us. But that’s where our new shipmate came in handy. Using his skills of unDead magik, Old Scratch was able to bring back the soul of Gunn and we learned that RatBeard had convinced the Waponi Wu to steal the treasure for him. So we were off to the Waponi Wu Volcano. My crew is not only larger, but they are adeptly experienced in battle as well. It wasn’t long before we made it to the top of the Volcano where we discovered RatBeard hanging from a rope over the hot fiery lava. And the Waponi Wu were in the process of sacrificing Gunn’s treasure to their Volcano God! I sure hoped they hadn’t tossed in the piece Avery sent us after! We managed to take care of the Waponi Wu and against my better judgement, we rescued RatBeard. And thanks to our kindness he too asked to join my humble crew. That’s one more. At least we acquired Gunn’s Treasure and took it back to Avery in Skull Island. Thankfully the piece Avery desired was still part of the treasure and we completed yet another task for the Skull Island Governor. Thanks to that he asked us to perform another mission for him. To work out a trade deal with the Monquistans in Puerto Mico. So that’s where we’re headed next. On our way we also stopped by Scrimshaw to find out what happened to Ratbeards sword and gear. We meet the barkeep Bardolf at the Hole in the Wall Tavern, who told me he had indeed heard of my sister Scarlet. Seems she has made a great reputation for herself and is well known here in the Tradewinds Skyway. 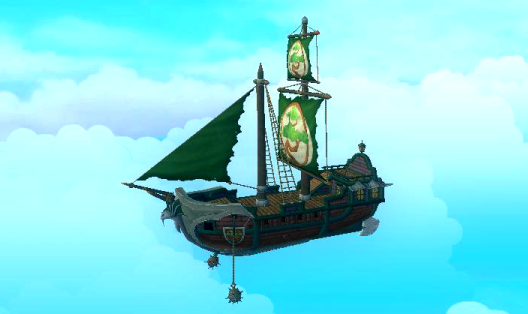 In fact, she’s here in Scrimshaw picking up supplies for a mission to Port Regal! Bardolf knew where to find her and sent one of his workers off to find her in town while we waited here in the Tavern! I was so excited to meet her face to face. When Scarlet came into the Tavern it was like looking in a mirror. I had no idea we were twins! We were both very young when our ship fell and us with it. 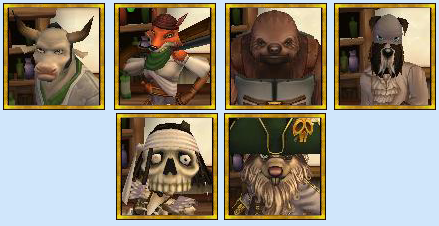 Both of us picked up by a Mooshu pirate, but taken to different lands within the spiral. It’s amazing how we grew so differently, yet nearly the same! We spent a great time in the Tavern talking about our childhoods and learning about each other. It’s odd to grow up seemingly alone only to discover someone else in the world is part of your real family. We take nothing away from the families who raised us, but it’s great to discover each other after all this time. Of course we couldn’t end our visit without a family picture on the docks of Scrimshaw. 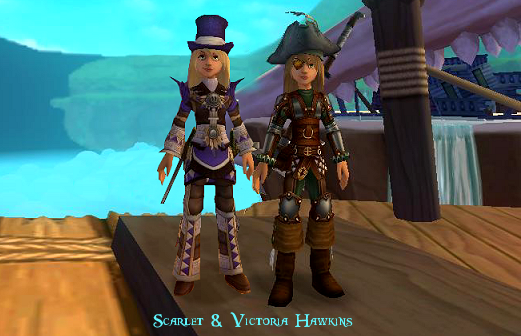 The Hawkins Sisters, sailing the skyways for treasure and adventure! 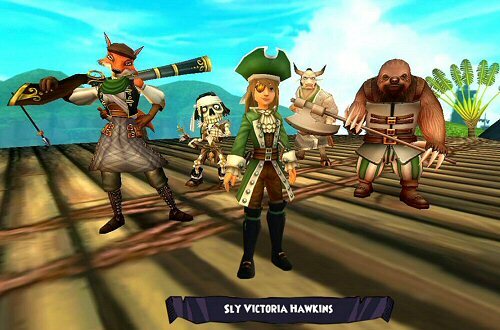 This entry was posted on November 30, 2013, in Captain's Log and tagged captain, game, hints, Kid friendly, kid safe, locations, log, online, Pirate101, Pirates, portal, quests, role play, ship, vessel. Bookmark the permalink.